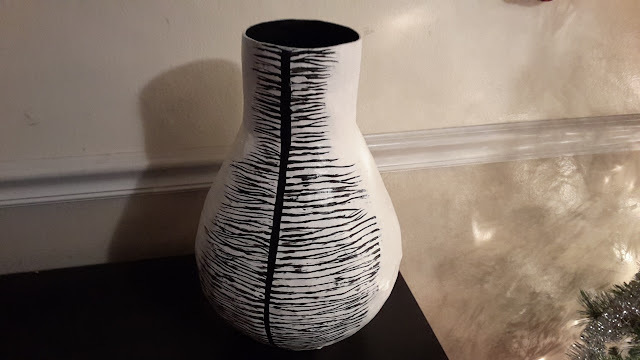 This post is very special to me, which is why I'm giddy with excitement to share my brand new decorative papier-mache vase made by Haitian artisan as part of the Macy's heart of Haiti initiative. One of the many highlights of Growing up in Haiti, besides the beach, conch, coconut, Fritay, Cremas and compas is the ART! My love for my hometown art started in my first year in secondary school, I suppose that would be the first year of middle school, but I'm not sure. I had a crush on my french's literature teacher Mr Rodney Saint Eloi! The man loved art, he would talk about it like it was air, he was passionate about local artisan, I became passionate about it too. I made it my weekly duty to check on the art museum, I would visit the street artisans ask questions, so I would know enough to impress Saint Eloi in class. Soon it stopped being about Saint Eloi and I would have discovered my own love for Haitian arts. If you ever seen a Haitian artisan take a used evaporated can milk and turn it into the most beautiful handcrafted piece of art you have ever seen, it's priceless. What they can do with papier mache technique is even more impressive. It's always been a secret dream of mine, to make the art of Haiti known! To get the guy who makes frames out of used cans recognized, the lady who make home decor on table cover with just a needle and colorful thread. I wanted to get them discovered and get paid for their work. The sales of Heart of Haiti products at Macy's put real, sustainable income into the hands of the artisans who create them, changing their lives in remarkable ways. Check out this heartwarming video here. This Holiday season you too can use your buying power to help an artisan in Haiti. These beautiful handcrafted Home Décors look amazing in any setting, dining room table, desk, near the Christmas tree like mine and make the perfect gifts. The gifts that give hope! I may not have the manpower and influence to put Haiti's art and beauty on the map... yet but what if you and I made a conscious decision to spend our dollars on gifts that give hope? How awesome would that be? You give a gift, they get a gift! Have you ever heard of the Macy's Heart of Haiti project?